Lucknow: The historic alliance between Samajwadi Party (SP) and Bahujan Samaj Party (BSP) ahead of the 2019 general elections on Saturday had no place for the Congress. 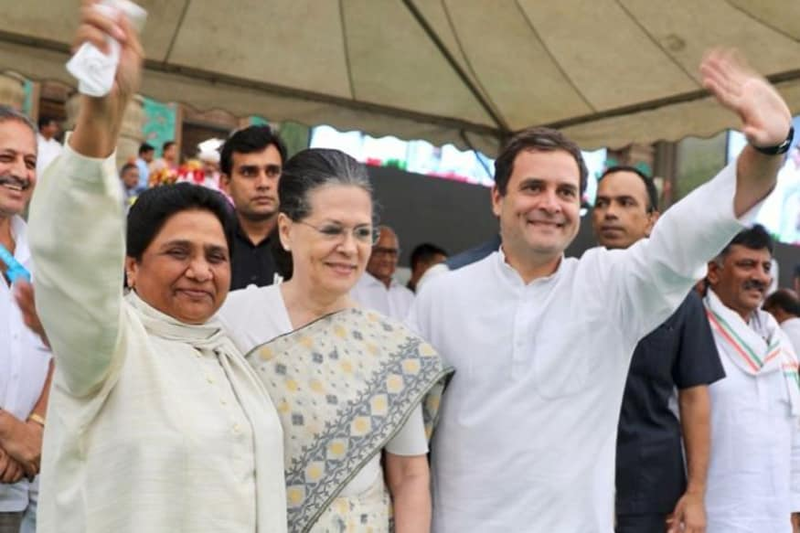 However, Mayawati and Akhilesh decided not to field candidates in the two Gandhi bastions - Rae Bareli and Amethi - represented by Sonia Gandhi and Rahul Gandhi respectively. While the BSP supremo spent a significant amount of time in explaining why the alliance did not approve of the Congress, one wonders why she was also quick to announce the decision about not fielding candidates from the two traditional Congress strongholds. She also equated Congress and the BJP at the Centre. “Both the parties have done defence embezzlement in their tenure. Congress lost due to Bofors, BJP will lose because of Rafale,” added Mayawati. “In last 2017 state assembly elections, even Samajwadi Party lost after their alliance with Congress,” she pointed out. The alliance decided to contest 38 seats each in Uttar Pradesh, which is, according to them, expected to decide the fate of Narendra Modi in the general elections later this year. Political analysts hinted at a larger political understanding behind the alliance arithmetic. While SP and BSP will be contesting 76 out of 80 seats and RLD will take two, the alliance has now taken responsibility of the state and has left the national task of dethroning the BJP from the Centre to the Congress. The current alliance statistic also allows the Congress to eat into the BJP’s vote share. Secondly, in a polarised election, an anti-BJP mobilisation of opposition parties tends to suit the BJP narrative and strategy. A BJP versus others fight has a high possibility of metamorphosing to Hindu versus others election. The Congress in the fray tends to temper the element of polarity, thus giving space to SP-BSP in making the polling caste-centric. Close on the heels of the alliance announcement, senior Congress leaders including AICC in-charge Ghulam Nabi Azad will meet on Sunday to chalk out the party's strategy. "Ghulam Nabi Azad, UPCC president Raj Babbar and other senior leaders will arrive in the state capital Sunday to hold meetings for finalising the strategy," Pradesh Congress Committee spokesperson Anshu Awasthi said.